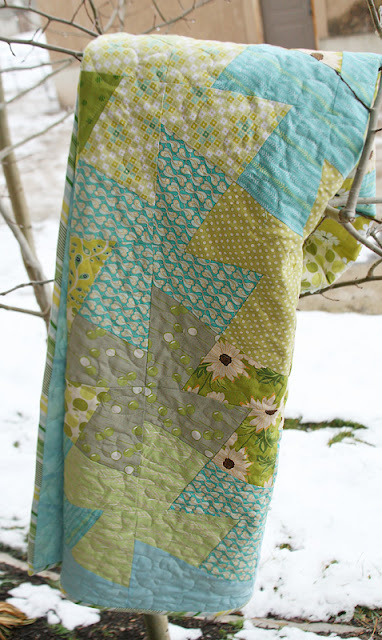 Quilt Story: FABRIC TUESDAY #22 Seriously! Hello again! Welcome back to fabric Tuesday! Megan told you about her brush with the stars. She forgot to tell you the best story. About 7 years back, our parents lived in southern California. Megan and I were taking a little Hollywood vacation. It was a funny funny night. We ate pizza on a sidewalk 10 feet from a homeless man as we watched an ambulance take someone out from a club. We were hoping it was a star. Then we thought we would go check out the Ivy because celebrities are always there. I was infront of Megan and suddenly turned around and freaked out. I was giggling, and crossing my legs so I wouldn't pee (give me a break, I had just had a baby.) Megan was dying because I couldn't compose myself to talk. Finally I uttered the words " It is Dawson Leery" from Dawson's creek. And yes, I did actually say Dawson Leery, and not his real name James Vanderbeek. Megan hurried past me to get a look. It was really funny and awesome! Okay, back to some relevant info. 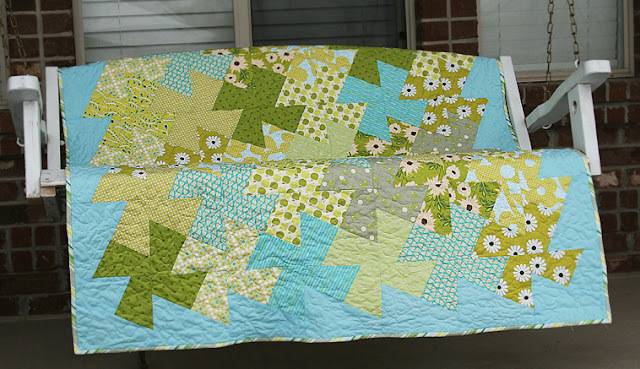 This is the quilt I made with Aunt Bea's fabric pile from a few weeks ago. PS AUNT BEA IS HAVING A HUGE SALE! I made it for my niece Hannah. (I hope the other kids don't expect one, because I have 35 nieces and nephews. (on this side alone!) She loves green and blues. And I think she loved this quilt. I did an all over stipple I was happy with. It is the largest quilt I have quilted on my own. I am really happy with it. AUNT BEA'S FABRIC SHOP IS ALL 30% OFF!!! HURRY AND GET THE GOOD STUFF! edited to add: Megan posted on Fresh Poppy Design, a sneak peek at her kitchen re-do and one of our new patterns, so make sure to take a peek! I'm a follower! :) Ready to link up as soon as it is Tuesday! BTW- GORGEOUS quilt! Hannah is one fortunate niece. I'm a follower! Love reading your blog! ooooh i lovity love lover it! those colors are awesome and like i said, i rarely buy those colors (you know me - always drawn to reds/pinks/oranges) but i should because i love how that turned out!! i know i linked to the unfinished monster quilt last week but now it's finished so i'm linking to it again - forgive!? Hello! That quilt is adorable! I love all those colours and the pattern! I have just had those shapes in my mind. Thank you for sharing! 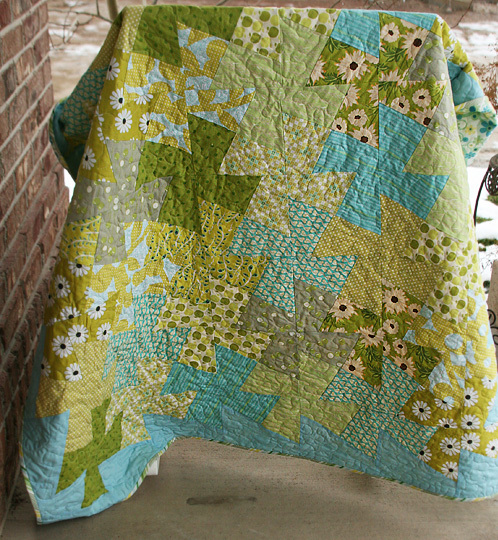 That quilt is very beautiful...greens and blues are my favorite! It came out great, I would love to try a pattern like that in the future! Thanks for hosting. Love fabric Tuesday. Happy to be following along. this quilt is so beautiful...those colors and the pattern are stunning. That quilt is amazing! What pattern did you use? I a have some really great scraps that need to be used up. That is just what I have been looking for. So cute! What fun! I'll definitely be following along and adding you to my blog list. First-time FT-er, so be gentle please (mine is #25). I love seeing all the variation in what folks are doing! Also, I was already a follower. I'm a follower! I love linking to Fabric Tuesday since the first time I heard of it. That is my new timeline. If I start something I always think to myself, "Can I get it done for next Fabric Tuesday?!" Love all the submissions, this is one of my greatest sources of inspiration, thanks!